The Thanksgiving Cutting Practice Sheets were the first set I designed. The boys loved it! So I did it again and created the Christmas Cutting Practice sheet which was a HUGE hit and our #1 post of that year! Wow! Both parents and teachers are eating this up! Scissors must be a bigger hit with kids than I know! 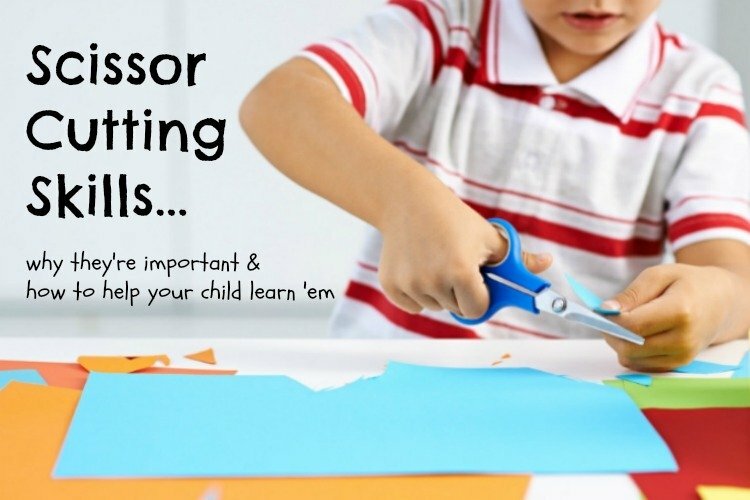 Little did I know just how much kids enjoy scissor activities, but also ALL the many benefits that teaching your kids to use scissors provides! When the therapists brought him back into the room, they sat him on the floor with child-size scissors and a scrap of paper. I was amazed! He looked like a little Edward Scissorhands the way he maneuvered this new tool, and within minutes had the floor covered with about 100 little triangles! Scissor exercises are so IMPORTANT for developing fine motor skills! When working on scissor cutting exercises, work on the easiest examples first. Start with straight lines, then soft curved lines, wavy lines, then lines with sharp angles. Hmmm… maybe I should make the scissor cutting practice sheets a little easier. But how easy? What age child would be using these? And if Connor was supposed to know how to (or at least been practiced on) scissor usage for federal early intervention services at age 3, how old should a child be when they start using scissors? Cutting allows a child to build up the tiny muscles in the palm of their hand with the continuous open and close of the hand. These muscles are also used for writing, painting, and gripping things like a toothbrush, spoon or fork, and even pulling up pants. Cutting enhances eye-hand coordination (using vision, processing what is seen, and moving the hand simultaneously to accomplish a task). Other examples of eye-hand coordination: catching/throwing a ball, scooping food with a spoon, and zipping a coat. Cutting encourages your child to use bilateral coordination (using both sides of the body at the same time while each hand is performing its own task). For example, when cutting a circle, a child must hold the paper with one hand (and continuously turn it) while the other hand is opening and closing the scissors and moving forward to cut. Other examples: zipping up a coat or pants, washing dishes, and opening an envelope. The first thing a child should learn for scissor cutting is how to open and close their hand and feel the sensation of cutting a piece of paper. If your child is having difficulty manipulating the scissors, try using other instruments or doing other tasks associated to cutting. For instance, tongs, tweezers, and hole-punchers require the same open-close motion of scissors. 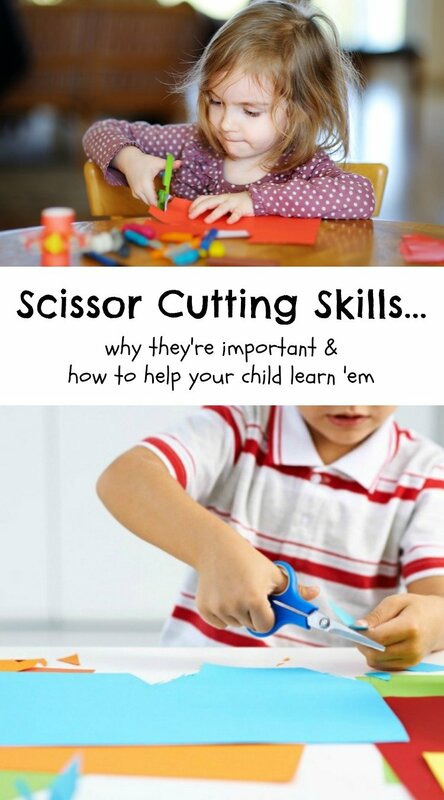 So how can you help your child develop their cutting skills? Make sure your child has the proper hand placement. My middle child is always turning his hand upside down so I keep reminding him, “Hey buddy, I need a thumbs up!” I also read to put a marker dot, sticker or a smiley face on the child’s thumb and remind them it needs to point to the ceiling. Playdough! This is what I first started Connor on for cutting. I have later found out it is the number one material therapists and other mommies suggest starting your child on! Plus, kneading and pinching the dough help with developing the hand muscles mentioned above! Cookie dough. Make up a batch of cookie dough and give the little tike scissors to cut the dough with. So what if its not a beautifully cut cookie? Your child will be proud of his/her artistic and chef abilities and that’s what counts! Colored construction paper. Let your child free cut. Then glue the shapes on to make an artwork mosaic! Play with scrapbook scissors. They come with such fun zig-zags and scalloped designs that it makes cutting even more fun! Just be cautious that the cutting edge is sharper so this may be more appropriate for older children. Scissor cutting practice sheets! Check out our newest Winter Themed sheets! Plus, pin the Thanksgiving Cutting Practice sheets and the Christmas Cutting Practice sheets for more cutting fun later in the year! Wow, moms! Who knew that there was more to scissors than well… just cutting stuff?! Now that we’ve got the down low, let’s get those kiddos cutting and crafting! That’s very interesting and informative. Thank you! I also want to thank you for sharing the free practice sheets. I saved them for my little granddaughter. She surely will have fun. Happy Easter and kind greetings from the EU (A). This is very beneficial information, thank you. My son has just turned two and hasn’t really used scissors. I will try the suggestions you have outlined and get him started. Thanks for linking up to Mummy Mondays. Have pinned this too! thanks for linking up and i hope you comeback next week. I have been down playing scissors thinking that “He can cut fine, we need to develop writing. “. My little guy is going to be a happier boy with more scissor work on the way! Before doing these cutting sheets, I had NO idea how much scissor cutting affects a child’s development in other ways. Sad to say, I would have probably not made the handwriting connection on my own. And I was the same as you with my oldest son “okay, he’s got scissor down… next!”. Needless to say, we have been adding more scissor activities into our crafts and activities and it makes them even more fun! Hope your little guy enjoys! Oh my gosh, I had no idea! I will definitely be getting a pair of child-proof scissors for my daughter! So glad you shared this post at the Foodies and Crafties Soiree! 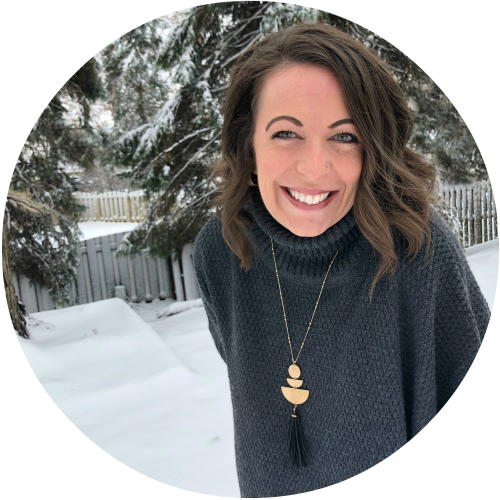 Kristin, I wish there were a manual for kids that tells us mommies “start scissors at age 2 and here’s how to do it…” After just learning all this, I am afraid I’ve missed several things along the way! Better late than never, right?! Your daughter will have lots of fun with her new scissors!